Losing your 8-year-old daughter to cancer is not what any mom ever wants to do, Kate Merrick included. And yet that is what she had to do and this is her journey through that grief. It's not so much about the cancer journey, so if that is what you are expecting, you will be disappointed. But if you are looking for hope in the midst of grief, then this is the book for you. She looks at Biblical women like Sarah, Bathsheba, and Mary and the journeys they walked through and provides insight for today. For example, we often look at the Proverbs 31 woman and grow discouraged and yet it is thought that Bathsheba wrote that. Look at Bathsheba's life, not very perfect, but she made the most of it and was most blessed. One of the things Kate talked about that stomped on my toes was the thing of bitterness. "Just a teeny bit, just enough bitterness that I feel justified about it. Just enough bitterness that it colors my sense of humor and peppers my thoughts, but it doesn't show up on my face. Hidden so well I didn't even see it at first. I almost missed it. A slight hint of bitter, just a little on the side, for dipping in now and again. " "Bitterness at the desolation of life. Bitterness at people who apparently have no pain. Bitterness at women who have kids to spare. Bitterness because I lost. I lost the contest, the race, the fight." This struck me, because I have been guilty of this very thing. Bitter because other people have children with seemingly little to no effort and I am left thinking about my babies in heaven and struggling for every child on earth we are blessed with. But it is still bitterness and it still needs to be dealt with. "Becoming aware of my hindering attitude of bitterness started a chain reaction that has since led to those bigger, better things - a deepening of faith, a realization that all things point to eternity; and this life, with all its trouble, is quickly coming to an end." I don't know if I'm there yet, but I want that deep faith, that ability to count on eternity and the capacity to laugh once again. And then she ends the book with talking about treasuring the moments. 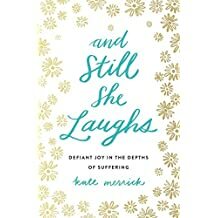 The Proverbs 31 woman talks about laughing without fearing the future and Kate invites us to experience that deep laughter. "Can we please laugh together? Can we please honor God, the Giver?....When he gives sweet memories, camp out there a little while, sweeping your soul with goodness. Let the food you eat not only nourish your cells, but let it be beautiful and delicious and flavorful and plentiful. Walk in the rain, splash in puddles, catch snowflakes on your tongue......If he has given you babies to love, pour it on thick. Rock and sing and kiss and bless, in the same way your Abba pours out to you. The home you have been given, have fun making it pretty....."
And in the midst of writing this book, Kate experienced a miscarriage bringing her number of children to three in heaven and two on earth. She knows the meaning of loss and yet she chooses to laugh and love in the midst of all of it. This book was given to me by Book Look Bloggers. I was not required to write a positive review.